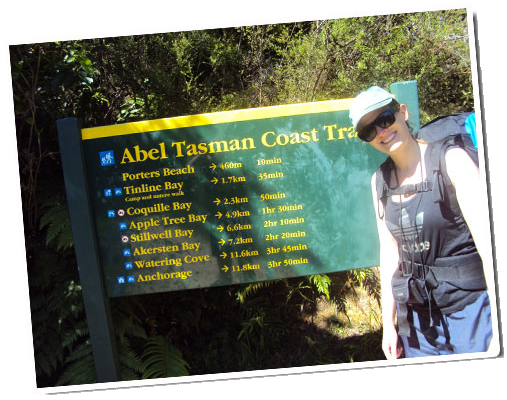 So like eager beavers (after some small packing issues), we headed down the road towards the start of the Abel Tasman Coastal Track, got a little bit lost in the DOC car park, and eventually found the National Park entrance. I know there must be some decent synonyms for ‘golden’ and ‘sparkling turquoise’, but they’re actually the colours of the sands and waters that the track meanders through. Although they don’t do it justice. As we made our way into the bush and climbed a little bit higher, we got warmer and warmer, and all I wanted to do was jump into the sea and bask in the sun. Instead, we started playing ‘who can guess how long DOC thinks it’ll take till we get to the hut?’ before reading each signpost, and making bets on who was closest. In the end we arrived around an hour sooner than DOC predicted we would. After about 2 hours in, we started getting pretty sore feet and felt a few blisters forming—despite wearing comfy shoes/boots that’d been fine previously. We figured the extra weight of the packs, and walking on the harder sandstone rather than mud were the causing factors. I had taken a 50 pack of sticking plasters with me. I definitely recommend others do the same. I returned with only 2 left. After 3 hours walking, we arrived at Anchorage Hut. 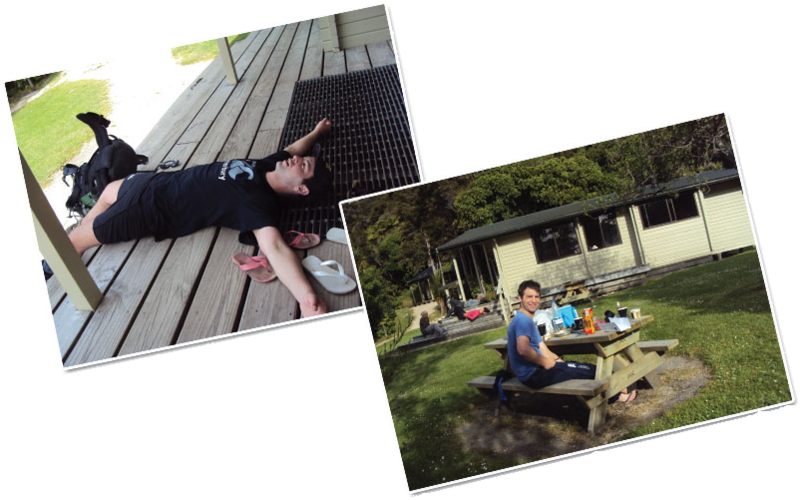 The sun was still out, there were people eating dinner on the beach and at picnic tables around the hut, and there were only 3 bunks left. We bagsed our beds, cranked out the wine and cheese and headed down to the shore. Bliss. As the sun went down, the sandflies came out so we headed back to the hut area to fire up the gas cooker. After dinner we went inside to play cards and realised we hadn’t brought any candles! We played by torch light for a while but headed to the bunk room shortly after. Ear plugs were a good thing with about 16 people in the room (lots of sleeping bag rustling and a few snorers). The next day, Sam had an early morning swim (I wasn’t so brave) and we prepared our gourmet breakfast—squashed croissants with camembert, avocado and ham. Delish. 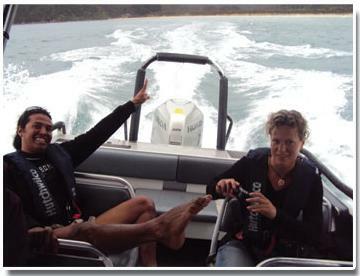 Before we left, we got talking to a Mexican guy who was also walking to Awaroa Hut that day. One thing I noticed was that there were no other kiwis on the trip! Lots of Germans, some Austrians and Americans. But no locals. The walk on the second day was amazing. There was only one difficult bit—a lengthy hill just after our lunch stop—but most of the time it was pretty flat. For this reason I reckon it’s the best Great Walk to go for if it’s your first time, or if you’re worried about your fitness levels. The track is really well maintained—there’s no figuring out where you’re going to put your foot next like in some tracks. You can also choose to break it up into just 3 or 4 hours of walking a day. We skipped Bark Bay hut on day 2, and as such, our feet were aaaaching. In the second half we actually took as long as DOC said we would because we were plodding along so slowly. We had taken the slightly longer route because we weren’t in tune with the low tide, but it didn’t matter. We crossed a few little streams, and I was lucky enough to be carried over a few by Sam, who took his pack, my pack, and me all at once (before you leap to conclusions about my wuss levels, I hadn’t whinged or made any complaints—I merely accepted the offer). Seeing Awaroa Hut in the distance as we turned the corner was the best sight ever, and even I was game for a swim after arriving. Afterwards we got straight to work on the remaining wine, cheese and crackers, and had a yarn with the friendly DOC hut warden who lives in a house nearby for 7 months a year. What a great spot! After dinner we got chatting with the others, including our new Mexican friend who’d arrived late after walking the low tide route despite it being high tide. There were only 12 of us all up, and there was a more open, chatty atmosphere among us, compared to the first hut that was full. The sandflies here were like nothing I’ve experienced before. They took no notice of the fact I’d drenched myself in insect repellent. The only option was to cover up or go inside. One tramper said coconut butter kept them away, so I’ll have to try that next time. On Sunday morning we woke to rain on the roof. We’d had to change our plans to taxi back from Awaroa instead of Totaranui because of a slip, so we headed to the lodge where the taxi comes in (via the skyline route for one last view). The ride back was about an hour and a half long. Seeing the land from the sea highlighted how far we’d actually walked! Our taxi driver doubled as a tour guide and we learnt heaps about the area, and stopped to see some sunbathing seals on the islands. We arrived back in the Abel Tasman Aqua Taxi car park pretty exhausted but happy we’d made it back in time and in one piece—even if we both had limps from blister overload. I told Sam I didn’t think I could handle another day, and therefore some of the longer Great Walks, but actually, if I’d had better shoes it would’ve been fine. I think you can even hire them so that makes things easy. Since putting the photos of our trip on Facebook, I’ve had 4 different people tell me they now want to do the walk. I hope I’ve inspired some readers to get booking too! 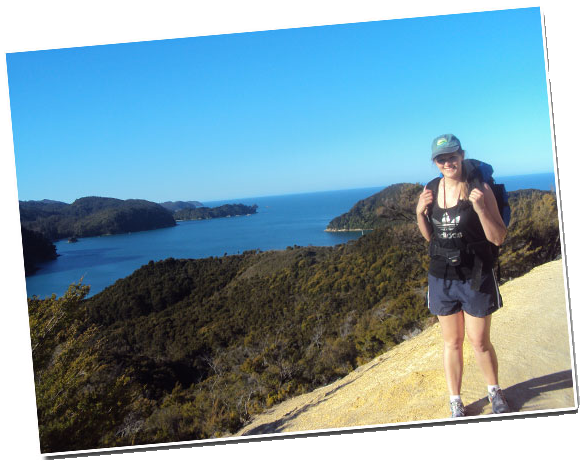 It’s definitely an amazing walk and now that I know what to expect, I’ll be getting a group of friends together early next year for the Waikaremoana Great Walk! Fun times ahead! 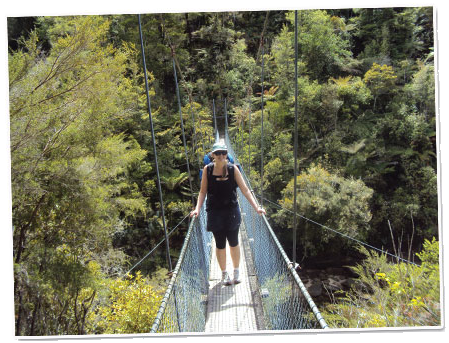 For info on all of the Great Walks, check out www.greatwalks.co.nz, and follow the Great Walks Facebook page.